I really enjoy schwarzbiers, but they’re definitely not a style you see all that often, even in this age of increasing craft beer enlightenment. I imagine that’s because they’re kind of a relic and caught stylistically inbetween a bunch of other places–a dark beer that is also crisp, not as powerfully flavored as your porters and stouts. It’s easy to see how a lot of drinkers getting into craft beer might go straight for bigger and badder dark beers, but there’s a certain schwarzbier quality I like very much. The best ones combine the aspects of a continental European pilsner and a drier, roastier version of a Vienna lager. There should be fairly low sweetness, a dry, roasty character and a good charge of noble hops. I like some spiciness in them, like you would get in a Czech pils. Unfortunately, that’s not quite what I got from this particular schwarzbier. NOTES: 22 oz bomber. Part of their special release series, which you would be able to read about on their website if they had a big boy website, but their official one still lists beers “upcoming in 2009.” Your best bet is to check the Facebook page for this kind of thing. APPEARANCE: Dark brown, not black, with ruby highlights. AROMA: A lot of roast in the nose but very little in the way of hops. Kind of smells like a latte with some scalded milk, in a good way. TASTE: Not very assertive, but a pleasant, easy-drinking pint. Kind of like an English mild with a little more crispness and roastiness. This doesn’t taste like I typically expect a schwarzbier to taste. There’s a chocolate flavor that is a bit like cocoa powder, and it’s pretty nutty as well. More like a dry nut brown ale than anything. More flavorful as it warms up, with just the tiniest buzz of spicy hops. Very little bitterness, significantly less than in most pilsners. DRINKABILITY: High. I could drink this every day at length. RATING: 2.5 hops. It’s a fine beer, but it’s really not to style in my eyes. I was looking for more noble hop character and more bitterness. It was kind of like the beer was half finished. If this had been labeled as “English brown ale,” it could easily have bumped up the final score. Overall, kind of an unusual choice for this typically-solid brewery to release as a special brew, and one that I have a feeling they won’t make again. Bombers are still on Chicago store shelves in some places if you’re curious. 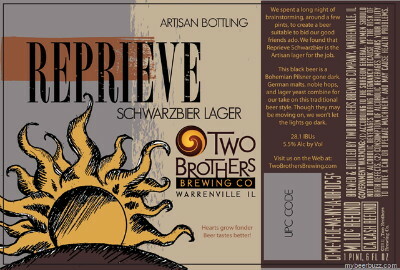 Posted in Tasting Notes.Tagged Schwarzbier, two brothers, two brothers brewing, two brothers reprieve. Holy crap, that is one of the worst brewery websites I’ve ever encountered. “We have been hand crafting our artisan beers since 1997” – copyright 1998…. I’ve had just two of their beers so far: the Heavy Handed IPA, and the Cane and Ebel Red Rye Ale. Both were fantastic. Pity more of their stuff doesn’t make it to Philly. Sorry to hear that this beer was just mediocre. While I’m not that familiar with the style, I’d be curious to give this Schwarzbier a try. And yes… their website could use some improvement. Thanks for the comment, G-LO. Cane and Ebel and Heavy Handed are two of their better beers. For the most part they’re very solid. And their special releases are usually a bit more interesting than this. Slouch–this brewery website is the one that is motivating me to eventually put together a “best and worst brewery websites” post. I’ve enjoyed all of the Two Brothers offerings I’ve had…shame about the Schwarzbier. I think it’s a style that used to be a little more “out there”, but has since been usurped by a myriad of more envelope-pushing dark beers like American Black Ales and Coffee Stouts. One of the best I’ve had comes from Duck-Rabbit in Farmville, NC. Smoky, smooth, and easy-drinkin’. How could you even find enough breweries to make a “best brewery websites” list? They’re pretty much universally bad with rare exceptions. For my money, Ninkasi has the best in the biz. Cool iconography, easy to navigate, embedded videos, and timely tweets/FB updates.